We had a looooooong weekend of wrestling starting on Friday with the annual Pottsgrove Takedown tournament followed by the Holiday Tournament on Saturday. The takedown tourn is pretty unique and there aren't too many of them around. It gives the kids a little taste of wrestling and goes very quickly. 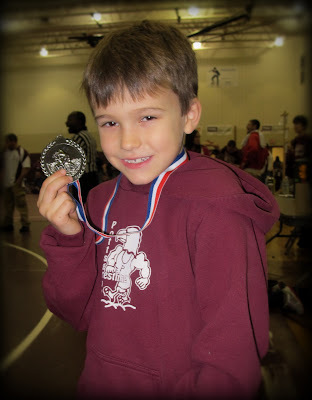 Michael did pretty well at the TD tourn. He lost his first match to a really good kid. His second he dominated his opponent. In the third match he got the first takedown, gave up the second, and then ended up losing because he grabbed the kids headgear. He took 3rd place - Not bad.